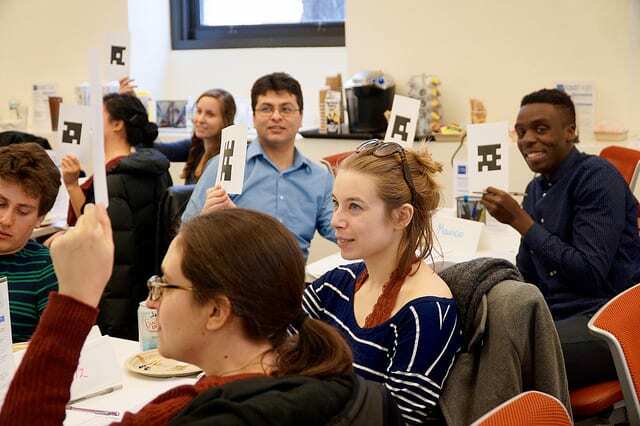 The CTL offers professional development programs and events that connect Columbia graduate students to effective teaching approaches, resources, and instructional technologies. The CTL runs a wide variety of offerings so that graduate students can choose the right amount of engagement in teaching development at any given stage in their academic programs. Visit the CTL Events Calendar to browse all upcoming events for graduate students. Graduate students can request in-person consultations to get support for their teaching and learning needs throughout the year. The CTL provides consultations to graduate students on a range of topics, including syllabus design, creating and refining a teaching statement, integrating instructional technologies into class activities, and presentation practices. CTLgrads Learning Communities are interdisciplinary and sequential conversations about teaching and learning topics, designed and co-facilitated by CTL Senior Lead Teaching Fellows. Teachers’ Lounges and Language Lounges are series of informal discussions about teaching practices and the culture of learning at Columbia. Graduate students can participate in microteaching sessions to rehearse teaching practices and get direct feedback and support from their peers. Graduate student instructors can request Mid-Course Reviews (MCRs) with trained peer consultants who can help solicit feedback from students on what they find to be the most helpful and the most challenging aspects of their course. CTL Mid-Course Reviews are confidential, formative, and designed to support instructors in their teaching practice. The CIRTL Network offers a variety of free, online resources, workshops, and courses that can fit into graduate students’ busy schedule. Graduate students can apply for seminar programs to engage in a supportive community of practice through a series of connected modules, workshops, and discussion groups on teaching and learning topics. Graduate students interested in developing new teaching approaches, applications, and skills with hands-on guidance from CTL staff can apply to participate in multi-day immersive institutes. CTL’s Teaching Development Program (TDP) is a comprehensive new service that will allow Columbia doctoral students to cultivate, document, and reflect on teaching development across the arc of their graduate school career. Graduate students can participate in the TDP program on either of two tracks: Foundational Track and Advanced Track. Teachers’ Lounges and Language Lounges are series of informal discussions about teaching practices and the culture of learning at Columbia. Are you looking for confidential feedback on your teaching? Request a teaching observation! The CTL offers Teaching Observations with trained peer consultants who can help you think through your course goals, your teaching observation experience, and your future teaching. CTL offers graduate students instructors orientation sessions to learn about practical, evidence-based strategies that they can implement on the first day of class. Graduate students can explore topics related to teaching, learning, and instructional technologies by registering for one- to two-hour workshops. Participants who attend a workshop series develop deeper understanding and skill.